Make Mine Beautiful's Home Decor Series, was developed in hopes of being able to teach readers about how to make better informed decisions for their homes, maybe teach them how to sew a bit, and to give readers a place to go to have their questions answered and their decorating and design dilemas addressed directly. Designer Friday is where I answer your decorating and design related questions - but beware - you may actually show up right here so that I can use your question to help other readers facing the same challenges. I recently received this letter from Traci at ThreeDogsAtHome. I'll let Traci tell you in her own words what kind of problem she is facing in her living room with her windows. ....................I have two windows on either side of my fireplace. They are different sizes but the same length and distance away from the fireplace. It is a very unusal room with a weird floor plan and I don't know if I should put drapery panels on both sides of each window or if I should put only one panel on the outside of each window . I hope this makes sense. The room is so unbalanced I can't decided what to do. My husband would say Analysis Paralysis. Attached are two pics of the room. Even taking a picture of this room is difficult. I am really looking forward to your advise. Here is the room and the windows in question. This post is related to solving an unbalanced window problem, but I will address some of Traci's room specific issues at the end and offer some tips to give the room a cohesive flow. 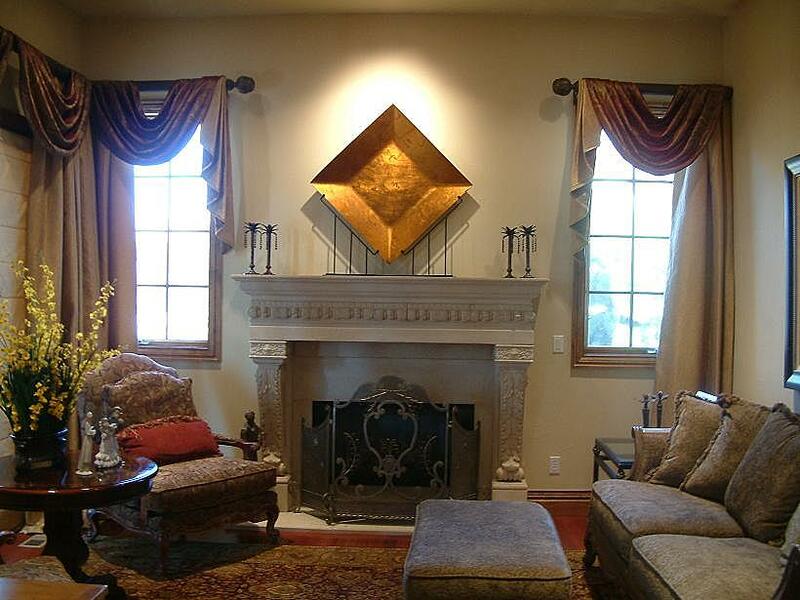 Designer's Solution: There are two windows flanking the fireplace. In Traci's case, her windows are two different widths but are the same length. They are also equal distances from the fireplace. Many of you probably have a room similar to this where you have a fireplace flanked by two windows, or a window and a door. The examples I'm going to post will service any of those situations. You'll also notice that in the top picture the window on the left has a vertical center divider, while the one on the right doesn't. This may be a visual hindrence to you, but it does not affect the solution for the treatment. The important thing in any case like this is to visually balance the windows. Which means you'll want to make the size of your window treatment fit the largest window, and then manipulate the larger treatment to look symmetrical on the smaller window. Make sense? For instance, if one window was 54" wide, and the other was 30" wide, you'd want to buy rods that fit a 54" window, or make board treatments in the 54" size. NOTE: This visual balancing trick only works if you will be adding panels to the window. It's hard to fake empty wall space with no panels to cover it up. When you put the 54" rod on the 30" window, you'll have 24" of wall space to hide. That's where that panels work miracles. 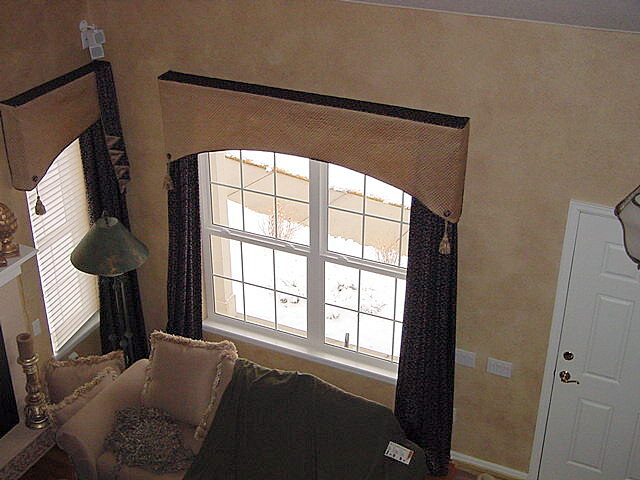 The symmetrical window treatments will take the attention off the misproportioned windows. Follow me? Here are a few examples of window treatments that are flattering to this kind of window situation. 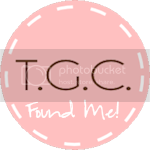 If you follow my blog, you already know I had a picture mishap last week and lost over 5000 pictures from my files. Unfortunately, many of them were in the Window Treatment category. So, because of that, you're going to have to use some imagination, but I'll guide you through the imagery. In this room, I have a door on the left and a window on the right. The window is a few inches wider than the door, but in this case, not enough to make a difference. Since we use this door regularly I needed a treatment that would allow me to still be able to go in and out. Because of this, I decided to use panels on rings so that I could slide the panel across the rod to clear the door opening. Also, we get blaring sun through the door in the mornings and I needed to be able to close the drapes during that time. If you look closely, you'll see that I installed the rods to extend a little to the outside edge of one side of the window. 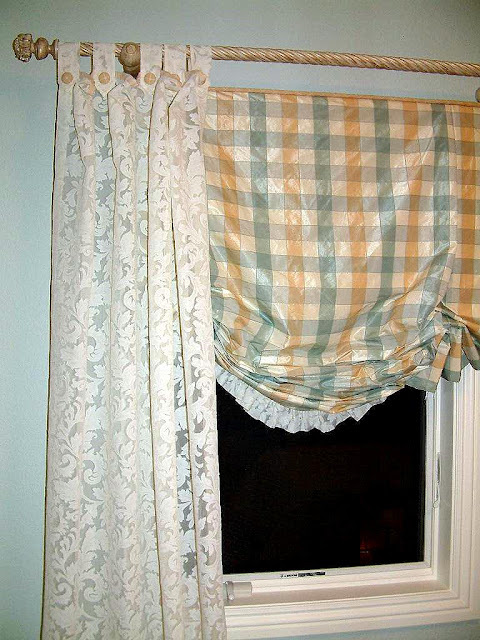 This allows me to clear the window as much as possible when the drapes are open. However, the rods are not symmetrically placed on the inside edge of the window because there is no need for the fabric to extend past the point of the trim. Make sense? Here's a treatment I did for a client. In Traci's case, she could extend the drapery panels on the rods into the window, and make the swags thicker across the rod. Yes, the swags would end up being two different widths on the window, but the symmetrical appearance of the treatments would soften the difference. This is where your imagination has to start coming in to play. This is actually a treatment I did for a teenage girl's room, but with a little creativity, you can transform this to fit Traci's windows. Imagine the treatment split in the middle. With this style, you would board mount the london shade, and then mount a rod about and to the outside of the board, as shown in the second picture. Also, because you would be using panels with this treatment AND a board mounted under treatment, you could make the treatment for both windows the same size. Why? Because the panel on the right window would cover up the wall space, so no one but you knows the window is smaller that the one on the left. Using this kind of treatment, you could forgo the tabs and use panels on a ring instead. Just be sure you mount your rod far enough out from the board underneath so that the rings clear the board. 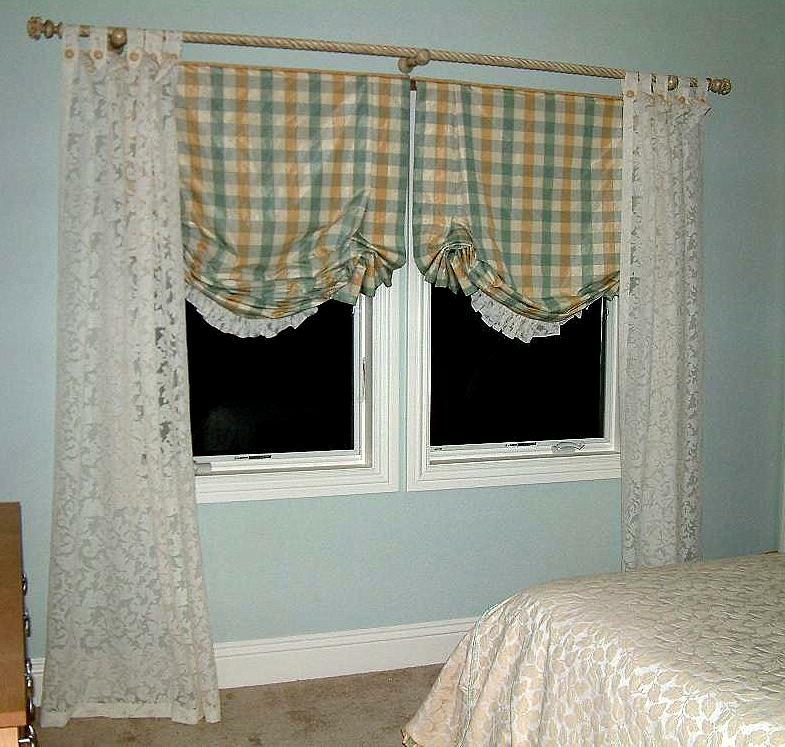 This application also allows you to open and close the drapes, OR raise and lower the shades. Here's another I did for a client with the same windows. This is a more formal home, and since this client is often traveling, privacy was a key factor. Here, I layered the treatments so that the panels would close on top of the sheers. I decided on the sheers as a means to give the window a softer look when the panels were open. This client didn't want a hard window product, so the solution was to add an organza sheer that allowed light filtering, yet offered privacy. You could do this treatment without the sheers and it would work just as well. Also, look closely at the top area of the sheers. See where the light ends and the dark part is behind the sheer? That shows you how high I hung the rods above the window. I did this to add visual height to the room (which I suggest that Traci do). And, look at the rods. See how I only have a finial on the inside of the rod? The outside of the rod runs into the wall. I simply put an end cap on it. This allows the panels to go all the way back so there is no dead wall space to the outside of the panels. 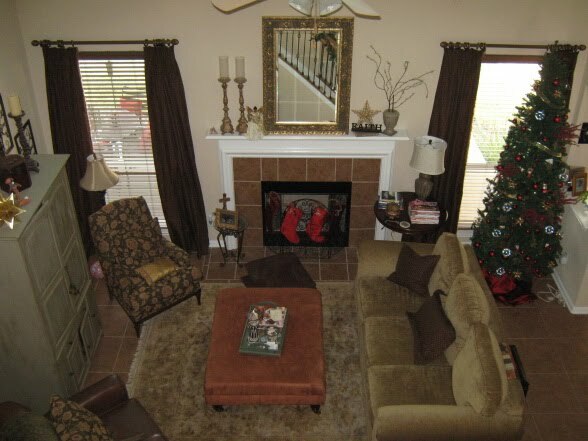 On a decorating note, see how the furniture is turned at an angle from the fireplace? Just because you have a fireplace in a room, doesn't mean your conversation area has to follow the layout of that. I chose to lay out the furniture in this room so that it created a more intimate conversation area. 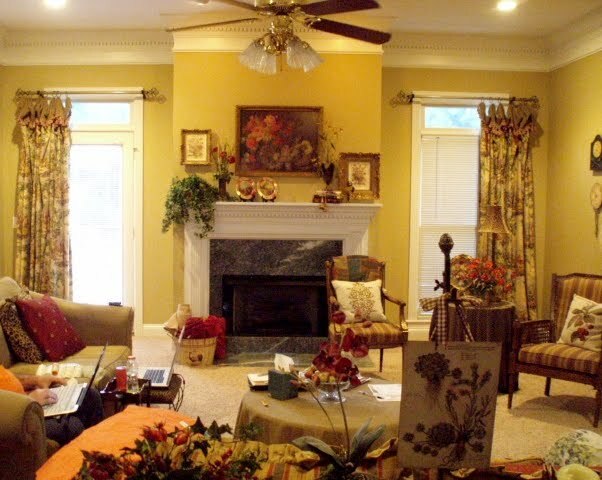 In larger rooms, when you allow the furniture to lay to either side of the fireplace, it creates a rather large gap between the people in the room. this particular room is only used during entertaining, so it was the perfect solution. 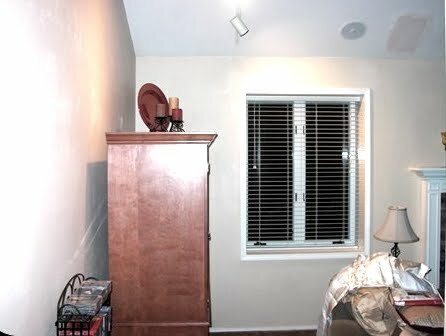 If you have an additional window in the room, this picture shows how you can effectively treat that. The is one of my favorite treatments of all time. It's simple, yet sophisticated, tailored with subtle curvature, and has fabulous feminine appeal, yet could be used in a man's study. I just love it, love it, love it. It's my go to treatment when nothing else just seems to fit. A treatment that needs no explanation. A great go to treatment in a pinch. My preference is for you to be more creative if the window allows. Isn't this a great room? Look at the treatment on the closet. This would be a perfect solution to Traci's window dilema. This would add needed drama to the room, give it a more upscale feel, and yet it would be graceful enough that it wouldn't overpower the windows or the room. These pictures all have vaible solutions for a 2 window wall. Just make a point to be a bit strict when selecting your fabrics. Layered treatments are best in more neutral patterns or monotone fabric combinations, while you can get away with stronger patterns and palettes for lighter weight treatments. 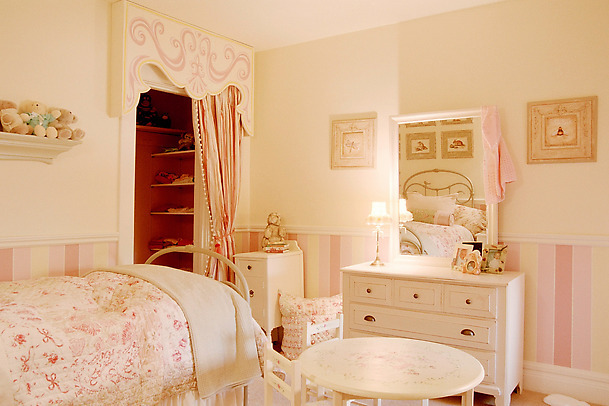 I'm posting her room picture again so that you do not have to scroll up for reference. This is all I can see of her room, so I'll be making a few assumptions in my assessment. There is a cabinet to the left along the wall which I'm assuming is a tv cabinet. Further, I assume that it's on that wall because that's where the cable outlet is. Next to the cabinet is a CD rack. I'm seeing the inside back of a chair in the forefront of the picture, which I'm guessing is a dining room chair, so I'm assuming this room backs up to the dining room. (Further digging into your blog tells me this is actually a message board. Is it just propped up at the end of the couch?) I wish I had more pics from a distance. I don't see any doors in the room, which means the layout isn't as restricted. On the right wall, there appears to be a buffet of some kind, and a small table covered with a cloth. Is that an animal cage maybe? There is a school chair in the far corner behind the sofa. There is a table with a lamp at the end of both seating areas. Designer Solution: Starting with the fireplace. The piece of art appears to be something very nice. However, it blends into the wall so much that it doesn't have an impact. I suggest painting a darker rectangle on the wall as a faux frame that extends out about 4 inches on all sides. Perhaps a nice chocolate color. This will make the art stand out from the contrast color so that makes more of a statement in the room. If it were mine, I would add a molding frame above the mantle that extends the height of the fireplace all the way to the ceiling, paint the inside of that, and then hang the picture in the center. The mantle is quite high, and when adding accessories that have height to them, make practical choices. Although the candle holders are pretty, they aren't very pracitcal. Each time you would want to light them, you would need to remove them and place them back after they are lit. That's a little risky to me. A better choice would be a couple of greenery pieces and maybe a collection of plates or book on stands. Be careful not to take away from the art by overdoing it. 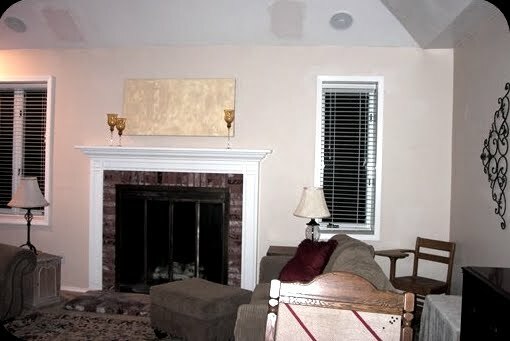 I would paint the brick to match the white surround. You'll still have the texture, but it will be less choppy with the blocks of color, especially if you add the paint above. I would add a shelving unit, not a shelf, to the wall beside the tv cabinet and place all of the CDs in that. The small rack is very out of scale. You can bring the school chair over under the wall unit. The chair looks like it's in front of the tv cabinet. Do you have room to bring the chair forward, turn it around facing the fireplace, and set the end table with it? If so, I would do that. It would function better in that position. Then, could you move the sofa forward a little, or put the end table at the opposite end? If so, you could move the small table with the cover on it underneath the right window, and then add a display to the top. If possible, I would move the tv cabinet down the wall to the left. If it's a matter of a cable cord, the cable company will give you a longer one for free. Doing these few things will open up the end of the room where the windows are so that it doesn't look crowded. Next, I would add a prints around the room. I would start by either painting a pattern on your lampshades, maybe add a stencil and some fringe, and then sew up a few toss pillows that have large patterns. These few touches will add a bit of curvature to the room, and give you a touch of whimsy. Here's a layout I found. I wonder if this might work in your room? Where the tree is, you'd put that small covered table under the window. Do you have a coffee table for this room? Has it been purposely omitted? From looking on your blog, it appears you have another living room, so I'm assuming this is the hang out room? I'm not sure what all is on your wall to the right, so I can't really address that in this post. The room definitely needs some color for contrast, and I would go lighter in color, rather than darker. 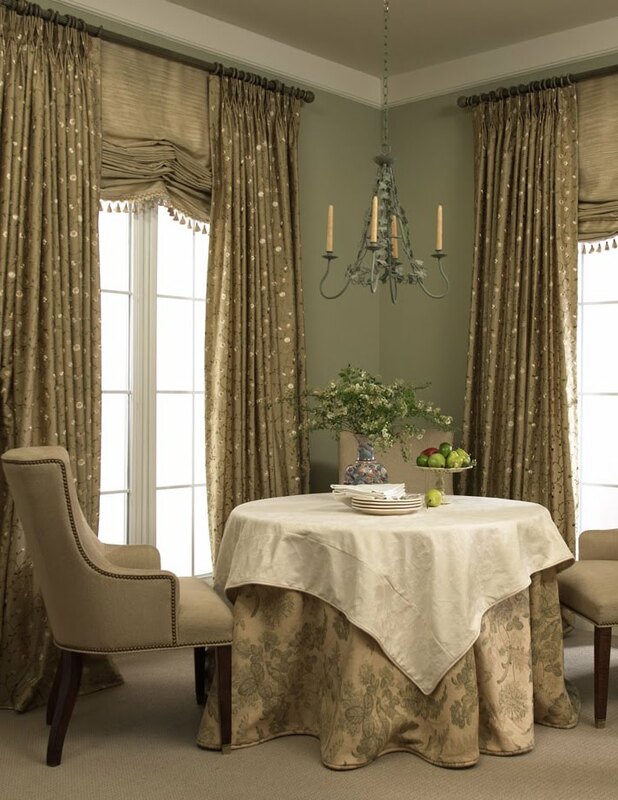 For your window treatments, if you choose one that requires a rod, use a strong color for the rod, with a neutral patterned fabric for the treatment. This will add the much needed contrast this room needs without adding additional colors. I hope this little experiment has helped you, Traci, and I hope that others have learned something along the way. I actually started this post early in the day, and have been pulled away from it several times, so here it is at 12:45 am. So sorry it didn't hit earlier. Would you like your questions answered here? Please leave them in the comments. If you'd like a decorating assessment like the one above, send me an email with your pictures and your issues. Be sure to include as many views of the room as possible. I try to answer many of them in email, but if I feel it is a question others may share, I'll address it on Designer Friday. Thank you for this post! Very enlightening and great ideas for this room. I have a room that I am struggling with. I kind of like the old world look that it has now which would have to be improved on as it is wallpaper paste and bits of wallpaper making that look. I also love the look of the windows now with the floor to ceiling sheers removed.We live in town and have much walking traffic so need some privacy at window at least in the evening- is there some type of treatment that would work here and still be able to close it? I want this room to be light- not dark and formal but am not sure where to go. Also am contemplating painting furniture to lighten the area up if I leave wood work stained but would that do what I want it to do or look strange. Everywhere I look the mouldings are painted white so I feel like I am bucking against current trends to keep trim as is. Any help or suggestions would be so helpful. I have just gone on to other things for now as I am stumped! Oh good I get to be the first to comment. Your tips on how to balance the windows makes perfect sense and I love all the options. While the brass doors are getting a black face-lift I never thought about painting the brick but I am now. What appears to be a tv cabinet is really my sewing center. Rather than shelving how about moving the cabinet away from the end of the wall allowing the chair to swivel to face the sewing cabinet if I have a guest talking with me while I am sewing or swivel back toward the couch for conversation. Some of the items in the room are leaving. The covered table is actually a toy chest and along with the students chair. An oak desk will be making a trip out to the garage for sale.The message board will be hung in the laundry room. I am still looking for a larger end table to go with the chair. I am so excited to start working on this project with all your new ideas. I giggled at your comment on my art. This is the first layer of the art I am creating myself. More color will follow as I finish this piece. So many great answers to my dilemma and so many wonderful suggestions. 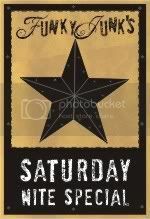 I want to start tomorrow! Thanks so much for all this great info I will have to keep this post for future curtain crisis. You Rule! I will post the progress as I make it. I can't tell you how much I appreciate the time you took to solved the room's problems and the add in extra tips too. I appreciate that you took some much time creating this post. I love the fist one and also the fourth one as well. Both seems to do very well with the rooms layout and also where the window and wall corners are located. Nice job! What terrific advice and some great examples. Almost makes me wish I had this dilemma so that I could play around with the suggestions you made!! LOL! Love all your examples, Polly! 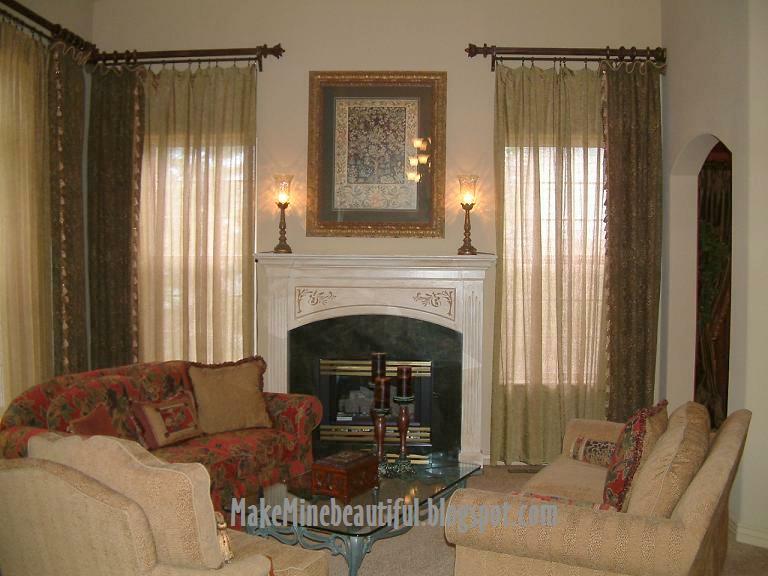 I love the drapes in your living room, too! I really like the treatment you did with the Austrian shades in the teen room. Love, love the picture of the dining room with the faux? shade and drapes. I see this type of window situation come up, too, and it really confuses people on how to dress the windows. Then they wind up with nothing up because they don't know what to do. I think your post is very helpful in that regard. what a great post. so much info & great pics of examples. 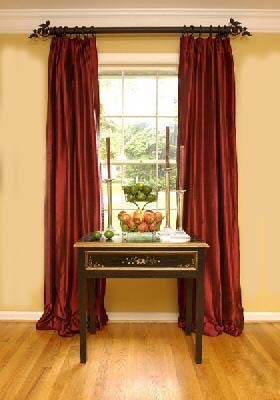 i know i get stuck on drapes so often, so all your tips were helpful. i can't believe you made an entire batch of framed pin cushions! so funny. i had seen that idea about a year (?) ago. it was more of a vintage look. when i saw the lib of london collection frame @ target i knew it would look great with the other collection & add a twist to that side of the room. Are you seriously doing this for free? Fridays, huh? Well, then, I better send you my pictures. Actually they're all on my blog. But I'll send them to you. Goodness, gracious, Miss Polly! You are truly the designer woman. Those window treatments are stunning. Now that we are getting ready to sell our home, I need you!!!!!!!! Great ideas and I look forward to reading your design solutions every week. I love the window treatments in your room. Hi Polly - I promise I will go back and read this post. I wanted to tell you I got a better shot on my current post of the artwork you commented about. Also, I have not been able to find the post you did for Donna on constructing pillows. I looked all over her blog. Do you have the URL? Okay, I read through your post. I love all of your ideas and have used many of them. (It freaks clients out to only use one final, I've found :)) Your favorite treatment of all time I have not used, but now will be on the lookout to (shamelessly) copy it somewhere. You are very generous to share your expertise. Polly! I have to come back when I have more time. Wow!!! I so want to dive into this one. Kim, I had to remove the post because I messed up the html on that one and it messed up blogroll loading. I'll post it where you can find it and get the link to you.